Phoeba Parsons lived all her life in Calhoun County, mostly "on the waters of Bear Fork." She was "borned" at Wildcat, just across the hill from her farm near Orma. Phoeba was from a pioneer Calhoun County family, the Cottrells, who were known for their music. Her father, John Cottrell, was a fiddler, dancer and he beat the fiddlesticks, which Phoeba demonstrated many times at the Sutton Old-Time Music Concert. She started playing the banjo as a young girl, following her brother, Noah Cottrell, who was well known as a performer, with Phoeba, at various festivals in the state. 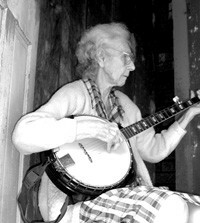 She also performed with Harvey Sampson, a Braxton County fiddler of some repute. Her sons continue the family's music traditions, especially Eugene, who is a regular at the Sutton Concert. Phoeba was an old-time singer who shared her songs with an apprentice, Ginny Hawker, through the Folk Art Apprenticeship program administered by the Augusta Heritage Center at Davis & Elkins College, in 1989. She was widely appreciated among younger old-time music enthusiasts at the Augusta Heritage Center's Program, at the Vandalia Festival in Charleston, and at the West Virginia State Folk Festival at Glenville. Other noted performances included the World's Fair in New York, the Brandywine Old-Time Music Festival in Pennsylvania, the Banjo Institute in Nashville and at the Celebration of Traditional Music at Berea College in Kentucky. None who witnessed Phoeba's performances with Melvin Wine at the Old-Time Music Concert at the Landmark in Sutton will forget the many hilarious on-stage moments the two had when Phoeba and Melvin ended the program prior to the presentation of the birthday cake. During the final years, Phoeba could no longer play banjo, but she insisted on playing fiddle sticks and dancing, with the aid of friends who kept hold of her elbows. The Landmark Studio's 2002 Old-Time Music Concert is dedicated to the memory of Phoeba Parsons. Back to Landmark Studio Home.